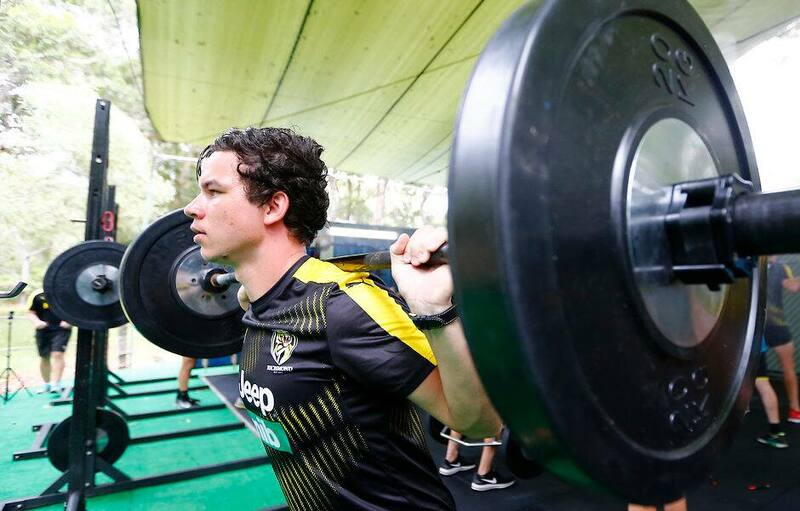 WHILE Richmond forward Daniel Rioli starts running on the Sunshine Coast, the Tigers main training group has launched what will be the toughest week of its pre-season. Richmond has travelled north for a gruelling five-day training group that was a key plank in its premiership success last season, moving into match-play for the first time on Monday. Physical performance manager Peter Burge said the pre-season had been building towards this week as the players prepare for pre-season games, starting for some with AFLX on February 17. "Our third week of training in January is generally our hardest week we that have in all pre-season," Burge told the club's website. "Today (Monday) was the first of the main sessions that we do, [and it] was pretty tough. "The drills are fairly similar to what we've done the last few weeks – very physical drills – and it's progressed each week. "The times of our drills have lengthened and the physicality of our drills has been high the last couple of weeks … we've just progressed into a little bit of match play for the first time today." Burge said the Tigers had stationed their pre-season camp in January to break up the post-Christmas block of training and mentally refresh the players at an important point of the summer. Premiership forward Rioli has used the camp to start his running program as he continues rehabilitation from an ankle injury sustained in the Grand Final. "He's started running out on the grass, and really we're re-educating him on how to run again, because he hasn't run for so long, he's been in a boot," Burge said. "We're teaching him how to move again, posture, all this sort of stuff with running before we start to do any longer running. "We want to get that right first. If we don't get that right first it could lead to other types of injuries, like over-use injuries. "He's doing really, really well. From what I saw today, his second session back out here, I was really impressed." Burge said young midfielder Nathan Drummond was on track to start full skills work by the start of February as he recovers from a second knee reconstruction, with the 23-year-old pushing to be available for round one selection. Ruckman Shaun Hampson is also on a modified program at the moment as he manages a back issue that restricted him for the majority of 2017. "We're expecting him to come back to football (drills) really soon," Burge said. The Tigers go for a warm-up run on the Sunshine Coast. Kane Lambert gives the skipping rope a workout. The outdoor gym made a change from the Punt Road facilities. Dustin Martin puts in the hard yards in the gym. Brandon Ellis fires away a handball. Skipper Trent Cotchin kicks during a drill on the Sunshine Coast.